Cayman Brac is one of the sister islands to Grand Cayman. It is 12 miles long by 2 miles wide and is located approximately 89 miles north east of Grand Cayman. Cayman Brac is an ecotourism paradise for divers and nature-lovers. Its legendary underwater walls and breathtaking marine life are thrilling. The diving varies from verticle walls to colorful reefs which promise beautiful hard and soft coral, plenty of turtles, groupers, stingrays and tropical fish. “The Brac” has wrecks to dive, the most popular is the MV Captian Keith Tibbetts, a 330 foot Russian Frigate that has become home to several eels, lobsters, fish and is covered with a thick coat of coral and sponges. The Brac Reef Beach Resort is located on a palm laden white sand beach with a full service day spa, fresh water pool, lighted tennis/basketball court, conference facility and award winning chefs at The Palm Restaurant. Topside activities available include bicycling, kayaking, rock climbing and spa treatments. The island is also home to more than 100 marked and unmarked caves that are interesting to explore. This is not a city location but rather a secluded tropical paradise. A Disabled Diver bringing their own A-1, H.S.A. Certified Dive Buddy or a Rescue Diver or above who has experience diving with disabled divers does not need to pay an extra fee. An A-1 trained H.S.A. buddy or a rescue certified diver or above, who has experience diving with disabled divers, selected to be a dive buddy for a disabled diver may subtract $350. This is on a 1st come 1st served basis as needed and is dependent on the number of disabled divers needing trained dive buddies. There are a limited number of rooms for disabled with wheel-in showers (assigned based on greatest disability). 3 rooms are accessible and have wheel-in showers with transfer/shower bench and hand held shower head.. There are several rooms that are semi accessible with a small lip on the floor in the shower, a shower bench and hand held shower head can be available with advanced notice. 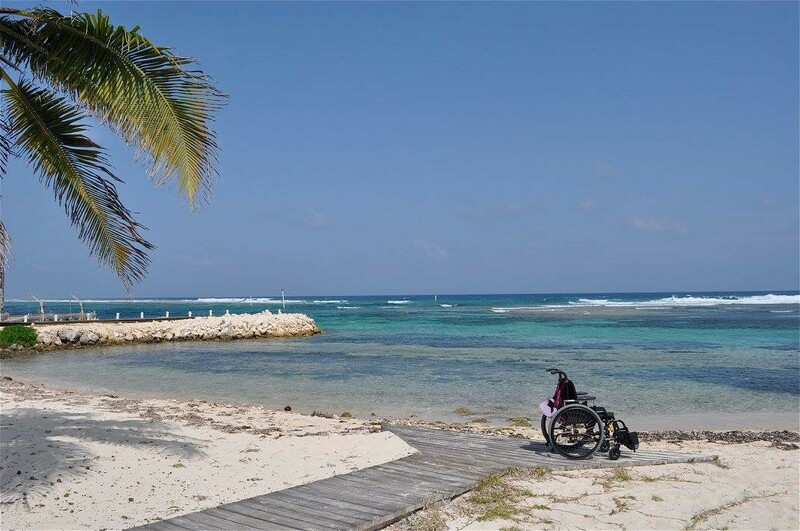 This trip is designed for divers with disabilities and their families and trained dive buddies. Able bodied divers are welcome. All U.S. Citizens must have a Current U.S. Passport with at least 6 months left before expiration upon return home. Special documentation required for children under the age of 18. A $400 deposit is required to hold your spot. Space is limited. Prices are based on double occupancy and current airfare and are subject to change. Please be aware the airline or operator may impose a fuel or tax surcharge over which we have no control, an additional fee may be charged prior to departure. Single persons signing up may be subject to additional charges. Changes to package and cancellation penalties do exist. Diver insurance is required & Travel Insurance is strongly recommended. Current Air schedule is as follows and is subject to changes. If the above flights will not work for you we can give you other options and pricing which would need to be paid in full at time of booking. They will most likely require over nights in one or both directions with additional cost which are not included in the package price. View photos from our 2017 trip!